Fact: I LOVE food! Especially when it’s a REALLY good meal from a restaurant. I’m the girl who is talking about what good places she’s eaten at recently WHILE eating at another restaurant. (Annoying, I know. 🙄) On top of that, I love trying new foods! Don’t get me wrong, I enjoy a burger and fries or yummy pizza as much as the next person but there’s a different kind of satisfaction from trying something outside of your comfort zone that tastes delicious. I understand that this isn’t for everyone. Sometimes you eat things that aren’t as appetizing as you hoped for and sometimes you are craving something in particular and nothing else will satisfy you. But trying new things (and new foods) can be fun! Several years ago on date night, my husband and I decided that we’d try to eat out at new restaurants. This was after we had our first child and our meals out were a bit more limited than what we were used to. We really wanted to “live it up” while going out. I’ve tried quite a few new places this year and here are my fave non-American restaurants in the 417. Now granted, I’ve only been to each of these places once but the food really impressed me. My husband and I started out the year Daniel Fasting, i.e. eating mainly fruits and veggies. Even though we were abstaining from different foods and focusing on our faith, we still needed to go out and spend quality time together so we gave That Lebanese Place a try. There are meat dishes available but they have a variety of vegetarian and vegan options if that’s your jam. I ordered the Batata Harra which is spicy (not spicy tasting to me, just seasoned) cubed potatoes cooked with garlic with a side of tomatoes. My husband ordered the Falafel Platter and we shared an order of Baba Ghanouj which is a dip of roasted eggplant, tahini lemon juice & garlic. (Before eating at That Lebanese Place I really didn’t know what Baba Ghanouj was. ☺️) Everything was delicious and we want to go again now that we’re back to eating meat. The first time I tried Indian food, I wasn’t a fan. I think it was because it is such a 180 from the “normal” American diet and for my taste buds at the time, I had no frame of reference. My tune has changed and if you want to give it a try, I highly recommend Taj Mahal! We went for a lunch date at their buffet and it was great! I wish I could tell you what I had but I tried a little of everything (my fave thing about buffets). I really enjoyed the Tikki Masala but I tried something else that was green. (I wish I could remember what it was. I’m pretty sure it had chicken but to be honest, I don’t know.) When I find out, I’ll tell you. Give their buffet a try during a weekday for lunch if you can. For me when I think of the word “ramen” I have flashbacks to the 10 cent packet of noodles that I ate frequently in my poor college days. 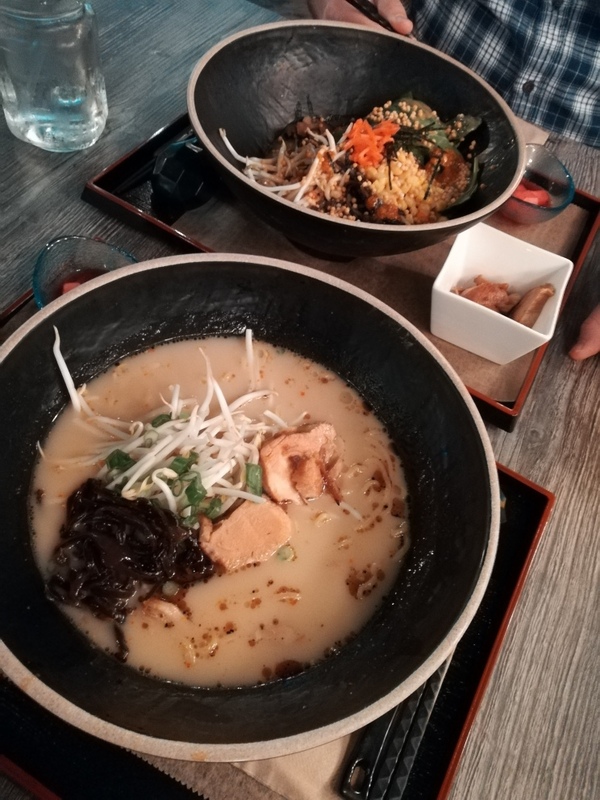 Karai Ramen is on the next level and features fresh ingredients and aside from the actual ramen style noodle has little in common with the grocery store grab. Perfect food for a rainy day. They also offer sushi which is good in my opinion but not necessarily my favorite in town. The atmosphere of this restaurant is lovely. Perfect for a casual date night out or grabbing lunch with a girlfriend. We went out on a date night & I ordered the signature ramen with chicken and my husband had a chilled ramen. I don’t know what it was called but I wish I would’ve ordered that. Our server described it as cold but in all honesty it was room temperature. It kind of gave me Asian salad vibes and I’ve been craving it ever since. I’ve always loved Jamaican food (HELLO Jerk Chicken!😋) but I hadn’t had a Jamaican patty until earlier this year. They are a little smaller than a hot pocket, have a flaky pastry crust and with delicious filling like beefy cheese, meatloaf and they also have a vegetarian option as well. So far I’ve had the ones previously mentioned but they also have a curry chicken that my husband and I can’t wait to try. They’re about the size of my palm & so delicious. They also offer smoothies! Swoon. These are my fave restaurants from my recent food adventures. Do you like to try new kinds of food or do you generally stick with what you know? What is your favorite ethnic restaurant in Springfield MO? If you don’t live in the area, what’s your favorite non-American dish? Comment below!